Takes two hours to complete. Bake for 45 minutes until puffed up, golden brown and hot through. Serve carved into thick chunks – it’s fantastic served with veggie gravy. Making sourdough starter takes about 5 days. Each day you 'feed' the starter with equal amounts of fresh flour and water. As the wild yeast grows stronger, the starter will become more frothy and sour-smelling. On average, this process takes about 5 days, but it can take longer depending on the conditions in your kitchen. As long as you see bubbles and sings of yeast activity, continue feeding it regularly. If you see zero signs of bubbles after three days, take a look at the Troubleshooting section below. Take down your starter and give it a look. You may see a few small bubbles here and there. This is good! The bubbles mean that wild yeast have started making themselves at home in your starter. They will eat the sugars in the the flour and release carbon dioxide (the bubbles) and alcohol. They will also increase the acidity of the mixture, which helps fend off any bad bacterias. At this point, the starter should smell fresh, mildly sweet, and yeasty. If you don't see any bubbles yet, don't panic — depending on the conditions in your kitchen, the average room temperature, and other factors, your starter might just be slow to get going. Weigh the flour and water for today, and combine them in the container. Stir vigorously until combined into a smooth batter. It will look like a sticky, thick dough. Scrape down the sides and loosely cover the container with plastic wrap or with a clean kitchen towel secured with a rubber band. Put the container somewhere with a consistent room temperature of 70°F to 75°F (like the top of the refrigerator) and let sit for 24 hours. Check your starter. By now, the surface of your starter should look dotted with bubbles and your starter should look visibly larger in volume. If you stir the starter, it will still feel thick and batter-like, but you'll hear bubbles popping. It should also start smelling a little sour and musty. Again, if your starter doesn't look quite like mine in the photo, don't worry. Give it a few more days. My starter happened to be particularly vigorous! When I made my starter here, I didn't notice much visual change from Day 3 to Day 4, but could tell things had progress by the looseness of the starter and the sourness of the aroma. Once your starter is ripe (or even if it's not quite ripe yet), you no longer need to bulk it up. 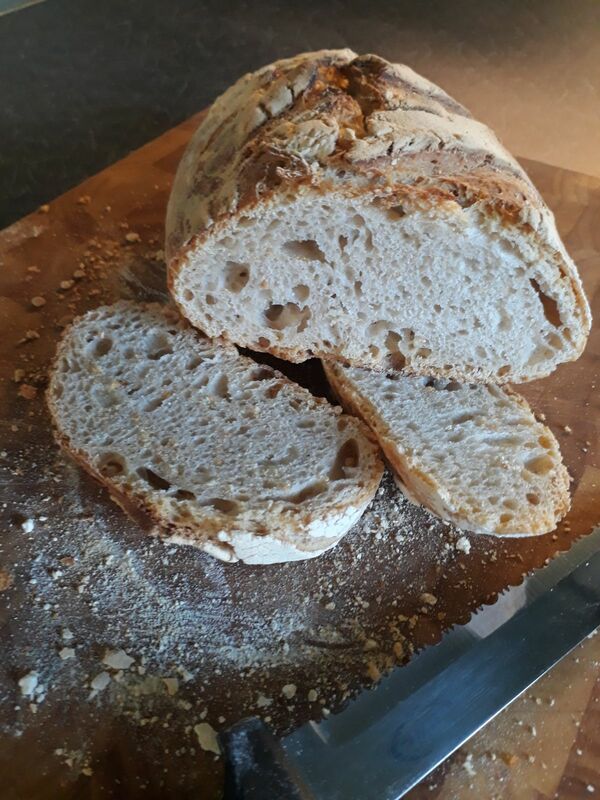 To maintain the starter, discard (or use) about half of the starter and then 'feed' it with new flour and water: weigh the flour and water, and combine them in the container with the starter. Stir vigorously until combined into a smooth batter. If you're using the starter within the next few days, leave it out on the counter and continue discarding half and 'feeding' it daily. If it will be longer before you use your starter, cover it tightly and place it in the fridge. Remember to take it out and feed it at least once a week — I also usually let the starter sit out overnight to give the yeast time to recuperate before putting it back in the fridge. Maybe you don't need all the starter we've made here on an ongoing basis. That's fine! Discard half the starter as usual, but feed it with half the amount of flour and water. Continue until you have whatever amount of starter works for your baking habits. Make a Thick Starter: Feed your starter double the amount of flour to make a thicker dough-like starter. This thicker batter will maintain the yeast better over long periods of inactivity in the fridge. Dry the Starter: Smear your starter on a Silpat and let it dry. Once completely dry, break it into flakes and store it in an airtight container. Dried sourdough can be stored for months. To re-start it, dissolve a 1/4 cup of the flakes in 4 ounces of water, and stir in 4 ounces of flour. Continue feeding the starter until it is active again. First loaf - nice and sour, good rise and nice crumb. second loaf - best yet, lovely taste, crust a little hard maybe. Make sure your sourdough culture is active: If your sourdough has been in the fridge, take it out 2 to 3 days before you plan to bake. Feed it daily to make sure it's strong and very active before you make the bread. The night before you plan to make the dough, combine a tablespoon of active sourdough culture with the flour and water for the leaven. Mix thoroughly to form a thick batter. Cover and let stand at room temperature overnight, for about 12 hours. Michel: I used 200g of my starter which was very liquid instead of the leaven. Generally, if the surface of the leaven is very bubbly, it's ready to be used. To double check, drop a small spoonful of the leaven in a cup of water; if the leaven floats, it's ready. Combine the salt and 50 grams of water for the dough in a small bowl. Set aside, stirring every so often to make sure the salt dissolves. 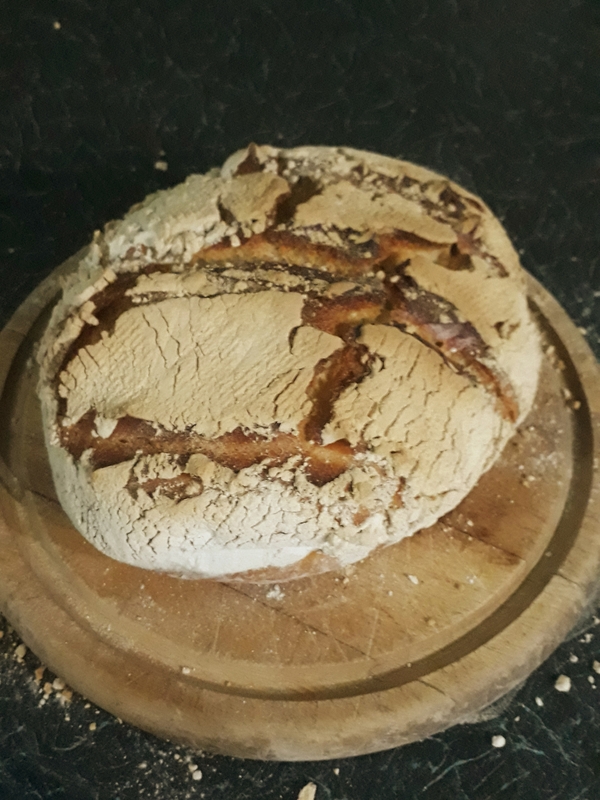 Combine the leaven and almost all of 475 grams of water for the dough in a large mixing bowl - keep some back in case the starter is too wet making the whole dough too wet.. Stir with a spatula or use your hands to break up and dissolve the leaven into the water. It's OK if the leaven doesn't fully dissolve and a few clumps remain. Michel: I used 250g water with the runny starter/leaven. Stir 700g of flour into the water and leaven with a spatula until you see no more visible dry flour and you've formed a very shaggy dough. Add the reserved water if too stiff or a little more flour if too wet. Michel: My dough seemed dry and very hard to stir with a spoon but if you put a finger in it was quite wet and sticky. Cover the bowl and let the dough rest for at least 30 minutes or up to 4 hours. This is the autolyse stage where the flour is fully absorbing the water and enzymes in the flour begin breaking down the starches and proteins. Michel: I rested in a warm room for an hour. Pour the dissolved salt over the dough. Work the liquid and salt into the dough by pinching and squeezing the dough. The dough will feel quite wet and loose at this point. To fold the dough, grab the dough at one side, lift it up, and fold it over on top of itself. Fold the dough four times, moving clockwise from the top of the bowl (or giving the bowl a quarter turn in between folds). Let the dough rest 30 minutes, then repeat. Do this a total of 6 times, every half hour for a total of 2 1/2 hours. The dough will start out shaggy and very loose, but will gradually smooth out and become tighter as you continue folding. Once you've finished the folds, let the dough rise undisturbed for 30 to 60 minutes, until it looks slightly puffed. This dough won't double in size the way regular, non-sourdough breads will; it should just look larger than it did when you started. Sprinkle some flour over your counter and turn the dough out on top. Work gently to avoid deflating the dough. Use a pastry scraper to divide the dough in half. Sprinkle a little flour over each piece of dough. Use your pastry scraper to shape each one into loose rounds — this isn't the final shaping, just a preliminary shaping to prep the dough for further shaping. Shape them into rounds by slipping your pastry scraper under the edge of the dough and then scraping it around curve of the dough, like turning left when driving. Do this a few times to build the surface tension in the dough (it makes more sense to do it than to read about it!). Flour your pastry scraper as needed to keep it from sticking to the dough. Line 2 bread proofing baskets, colanders, or mixing bowls with clean dishtowels. Dust them heavily with flour, rubbing the flour into the cloth on the bottom and up the sides with your fingers. Use more flour than you think you'll need — it should form a thin layer over the surface of the towel. Dust the top of one of the balls of dough with flour. Flip it over with a pastry scraper so that the floured side is against the board and the un-floured, sticky surface is up. Shape the loaf much like you folded the dough earlier: Grab the lip of the dough at the bottom, pull it gently up, then fold it over onto the center of the dough. Repeat with the right and left side of the dough. Repeat with the top of the dough, but once you've fold it downward, use your thumb to grab the bottom lip again and gently roll the dough right-side up. If it's not quite a round or doesn't seem taut to you, cup your palms around the dough and rotate it against the counter to shape it up. Repeat with the second ball of dough. Dust the tops and sides of the shaped loaves generously with flour. Place them into the proofing baskets upside down, so the seams from shaping are on top. Cover the baskets loosely with plastic, or place them inside clean plastic bags. Let them rise at room temperature until they look billowy and poofy, 3 to 4 hours. Alternatively, place the covered basket in the refrigerator and let them rise slowly overnight, 12 to 15 hours. If rising overnight, bake the loaves straight from the fridge; no need to warm before baking. Use a lame, sharp knife, or serrated knife to quickly score the surface of the loaves. 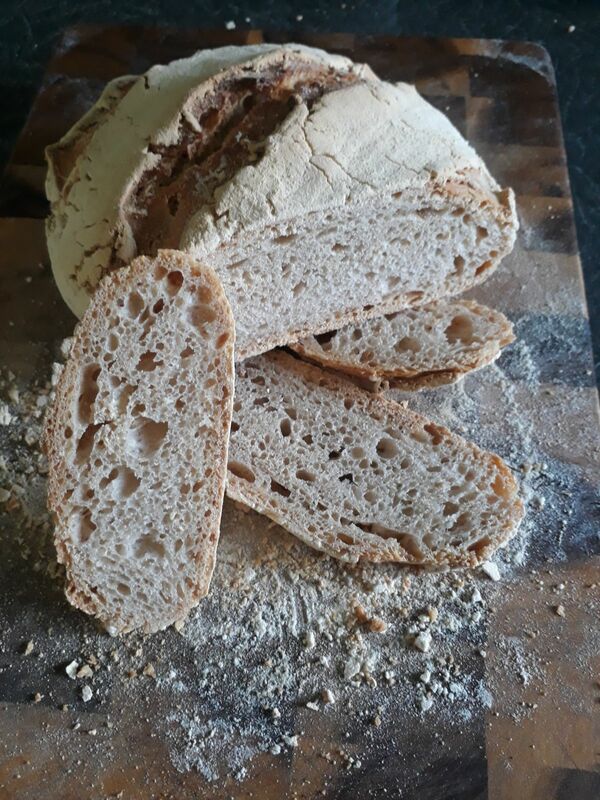 Try to score at a slight angle, so you're cutting almost parallel to the surface of the loaf; this gives the loaves the distinctive 'shelf' along the score line. Cover the pots and place them in the oven to bake for 20 minutes at Gas Mark 9. Reduce the oven temperature to Gas Mark 8 and bake another 10 minutes. Resist the temptation to check the loaves at this point; just reduce the oven temperature. Remove the lids from the pots to release any remaining steam. At this point, the loaves should have 'sprung' up, have a dry surface, and be just beginning to show golden color. Place the pots back in the oven, uncovered, at Gas Mark 8. Continue baking until the crust is deeply browned; aim for just short of burnt. It might feel a bit unnatural to bake loaves this fully, but this is where a lot of the flavor and texture of the crust comes in. Cool the loaves completely: When done, lift the loaves out of the pots using a spatula. Transfer them to cooling racks to cool completely. Wait until they have cooled to room temperature before slicing. Whole-wheat sourdough: You can replace up to half of the all-purpose flour with whole-wheat or whole-grain flour. All-purpose vs. bread flour: Bread flour will give your bread a sturdier, chewier texture and a loaf that's easier to slice. Loaves made with all-purpose flour will be a bit more delicate, especially when you cut them, but still work just fine. If your loaf sticks to the proofing basket: This still happens to me all the time! It's annoying, but not the end of your sourdough dreams. If some of the dough stays stuck to the lining of the proofing basket, try to gently disengage it or pinch it away with your fingers. Fold a pinch of dough over the tear and bake as usual. The crust will look a little rough where it was torn, but the bread will still taste delicious. Based on a Hollywood recipe but changed to allow first prove in the fridge overnight. This was a nice bread but lacked the sour taste. It was the most similar to 'normal' bread of all the recipes to date. Julie's favourite to date but I preferred the long prove method. Overall 1 hour bake - a lot of flour from the prove basket on the loaf. 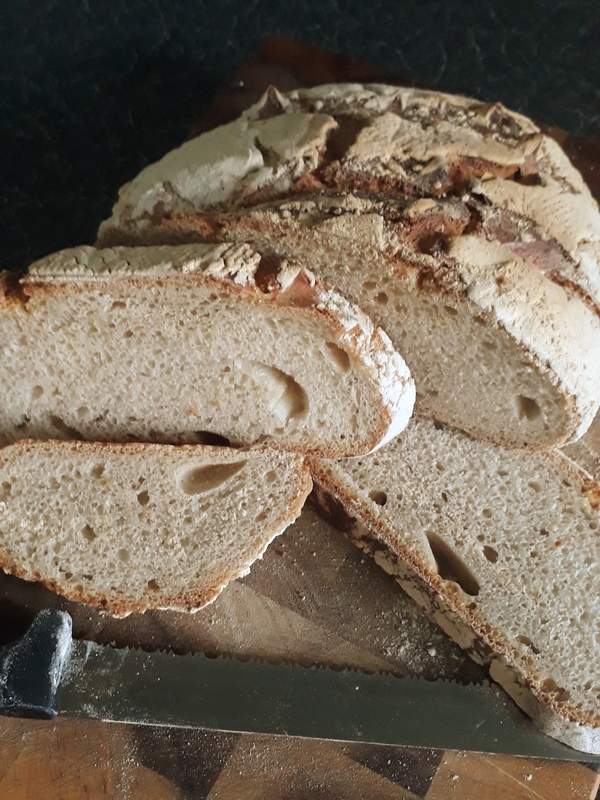 Nice crumb but could do with more big holes. Taste lacking sourness of longer proven bread. Combine the flour, starter and salt in a large mixing bowl. Add the water, a little at a time, and mix with your hands to make a soft dough (you may not need all of the water). Coat a chopping board or work surface with olive oil, then tip the dough onto it and knead the dough for 10-15 minutes, or until the dough forms is smooth and elastic. Tip the dough into a lightly oiled bowl and cover with cling film. Leave to rise in a warm place for up to five hours, or until at least doubled in size - can place in the fridge overnight in the middle of this proving. I did an hour in the warm before fridge overnight and then a few hours in the warm again. Take out of the fridge and return to warm place for rest of proving. Knead the dough until it’s smooth, knocking the air out. Roll into a ball and dust with flour. Tip the dough into a well-floured round banneton or proving basket and leave to rise for 4-8 hours. Use a Dutch Oven and heat the oven to Gas Mark 9. Cut the top of the loaf after gently rolling it into the Dutch Oven. Gently tip the risen dough onto a lined baking tray. Bake the loaf for 30 minutes at this heat, then reduce the heat to Gas Mark 8. Remove the lid from the Dutch Oven and bake for a further 15-30 minutes. I use a long bake to get the crust very dark brown.